While the job posting is imaginary, the job itself is not. 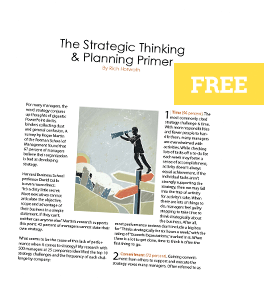 In organizations around the world, millions of hours are spent filling out templates: business plans, marketing plans, sales plans and strategic plans, to name just a few. People are becoming highly skilled at filling up slide decks with information: market data, sales numbers, customer revenues, etc. Never have so many presentations said so little. I recently reviewed a strategic plan developed by a regional director that didn’t actually contain a strategy. Honest. I even double-checked. The word “strategy” wasn’t used once. What’s been lost in the process, or in some cases has never existed, is the ability to think strategically about the business to generate insights that lead to new value for customers. The 2013 HR Benchmarks Trend book produced by the Society for Human Resource Management cites research showing that the #1 skill job applicants lack is strategic thinking. 1. Stimulate new thinking.The reason most plans are nothing more than a compilation of last year’s updated goals and tactics is because no new thinking takes place. Identify and select questions, tools and frameworks to productively facilitate thinking and dialogue about the key business issues. Then visually capture the important insights from the discussion using the appropriate strategic thinking tools. If you find yourself trapped in a check-the-box process overflowing with useless templates and little insight, you’re not alone. But, it’s not too late to change things for the better. Here’s your prescription: more thinking + fewer templates = better business.